Taken from the universally known and respected Yuasa NP catalogue, the NP1.2-6 is a sealed, non maintenance required 6V 1.2Ah lead acid battery suitable for general use applications that require a reliable battery power source when direct mains connection is not available. Constructed to Yuasa high standards this is a sealed product and can be installed in varying orientations as required. 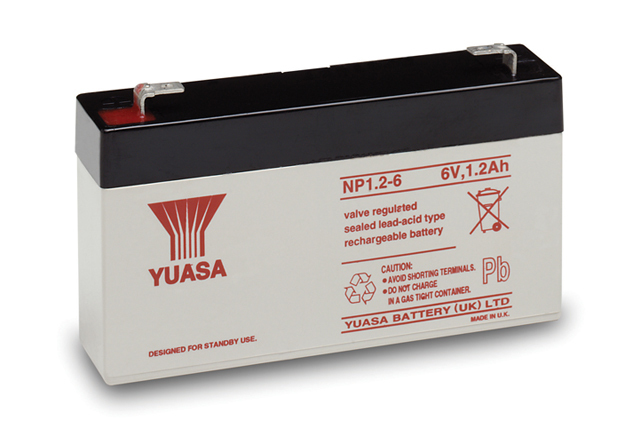 The Yuasa NP1.2-6 battery is built to guarantee there is no leakage of electrolyte from the case or component parts by using a controlled sealing technique and strict, documented manufacturing process. If you are looking for a reliable small sealed lead acid battery then you need look no further than the Yuasa NP1.2-6. This battery is also 100% recyclable, in common with the entire Yuasa NP battery range. Blue Box Batteries keep large stocks of the Yuasa NP range to ensure swift order dispatch when needed most. Find out today why so many choose to buy their batteries from us every time. Will this battery arrive to me fully charged? The Yuasa NP1.2-6 will in 90-95% state of charge approximately, we recommend charging before use if possible.